To promote the August 4 launch of the Stargate Atlantis Fans’ Choice Blu-Ray Disc, I have one copy of the disc courtesy of M80 to give away to one luck winner. The disc includes the top two consumer-selected episodes: “Rising” and “Enemy At The Gate” as selected by the fans in a competition earlier in the year.. Contest is open to US and Canadian residents only. To enter, leave a comment telling us what your all-time favourite scifi TV show is. For an extra entry blog about the giveaway and leave your link in the comments. Contest runs until Saturday August 8 at Midnight EDT. I'll announce the winner next SciFi Sunday. If your profile doesn't contain an email link for contacting you, leave your email in the comment. LOS ANGELES, CA – MISSION: FANS’ CHOICE. MGM Home Entertainment commissioned sci-fi fans worldwide to vote for their favorite “Stargate Atlantis™” episodes and created the ultimate “Stargate Atlantis Fans’ Choice.” MGM Home Entertainment commissioned sci-fi fans worldwide to vote for their favorite “Stargate Atlantis™” episodes and created the ultimate “Stargate Atlantis Fans’ Choice” Blu-ray Disc for fans, by fans, arriving August 4. Earlier this year, avid Atlantis followers had the chance to log onto www.SGAfanschoice.com and vote on the best episodes from the People’s Choice Award*-winning series. Giving consumers ultimate control from start to finish, fans also had the opportunity to design the cover art which was voted on by fellow fans and selected by “Stargate Atlantis” producers. 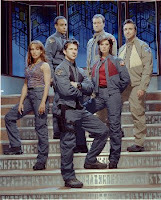 Enshrined in the fan favorite galaxy are beloved characters John Shepard (Joe Flanigan; The Other Sister), Rodney McKay (David Hewlett; “The Triangle”), Teyla Emmagan (Rachel Luttrell; Imposter), Ronon Dex (Jason Momoa; “Baywatch: Hawaii”), Samantha Carter (Amanda Tapping; “Sanctuary”) and Richard Woolsey (Robert Picardo; “Star Trek: Voyager”). 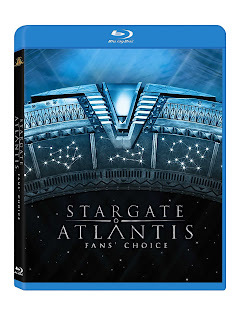 The “Stargate Atlantis Fans’ Choice” Blu-ray disc is the only high definition release planned for the “Stargate: Atlantis” series and will be available for the suggested retail price of $29.99 U.S. / $32.99 Canada. Prebook is July 8. Stargate SG:1 would be my favorite. Atlantis was a cool spin off but nothing was better than the four main characters from that show: Colonel Jack O'Neal, Sam Carter, Teal'c and my favorite Dr. Danial Jackson. Well would it be wrong to say that Atlantis was my favorite show. I also love Eureka, Sanctuary and am really starting to like Warehouse 13 and am looking forward to the new Stargate series in the fall. Stargate is a favorite, but BSG was on my must watch list. I also enjoy Eureka and Farscape was great. My all time favorite from even before my birth; yes, from the womb on, in Star Trek in almost any reincarnation. Star Trek, New Generation, DS9, and even Star Trek Enterprise - although I like the others better, still a decent show. I love watching all the movies and the new Star Trek movie was freaking amazing! Totally blew me away! The geek in me is showing. My favorite sci-fi has to be the Middleman. 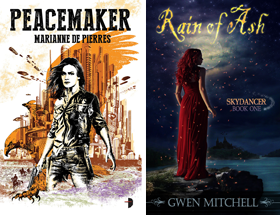 It was able to bring whit and whimsy to a genre that recently has been very serious and dark. I'd have to say my all time fave would be Stargate SG1. While I'm also a huge Star Trek, Eureka, BSG, SGA, Sanctuary, and then the fantasy like Buffy, Angel, Smallville etc.. also really liking the Warehouse 13... Stargate SG1 has always been my favourite. I'm also posting about the contest on my blog, I also do follow yours, and a big thanks for all your hard efforts in reviews etc. I've found quite a few books that I wouldn't have known about.. so thanks!! was selected the winner. Congrats!